This is a somewhat wordy article about the surname Wu and my lineage. It is intended as a record of our clan for the benefit of the younger Wu family members. Hope you will find it interesting too. Although small in number now, the lineage of the Wu is old. This surname started 2,500 years ago when our first ancestor was granted the land of Wu as his tiny fiefdom. By that account, I am the 75th generation Wu. This lineage is as old as that of Confucius 孔夫子 whose 79th generation grandson is alive today. While the lineage of Confucius is meticulously and officially documented for the last 2,500 years, the Wu lineage is less carefully documented. According to the Wu family tree book 族譜 compiled 80 years ago, many of the last 75 generations had illustrious persons serving as scholars, officials or generals. I suspect the family tree authors included all famous Wus of past years into the family tree. As my grandfather contributed money in the compilation of the 14-volume Wu family tree book, he received a copy and it is being kept by my fourth uncle’s family in New York. My third generation ancestor is a well-known historic figure and his epic story is deeply embedded in the Chinese culture. He has been deified and worshipped in temples. Wu ZiXu 伍子胥 lived in c 500BC, fled from the kingdom of Chu 楚國 to escape persecution. During his escape, he was ferried across a river by a boatman who recognized and admired him. Upon disembarking, Wu asked the boatman not to reveal his whereabouts. To assure Wu that he would not leak this fact, the boatman drowned himself, practicing the highest form of Chinese chivalry. Continuing his escape, Wu ZiXu worried so much about being captured his hair turned white overnight, providing a perfect disguise. After he escaped to the kingdom of Wu 吳國, he was known as a capable man and was made a high official. He befriended Sun Zi (Sun Tzu) 孫子 who wrote the famous book of strategy The Art of War 孫子兵法, and recommended Sun to serve the Wu kingdom as well. The Wu king tested Sun Zi’s generalship and ordered him to organize his giggling concubines into disciplined soldiers. Initially, the women would not follow orders thinking it was a joke. After Sun Zi executed two of the king’s favorite concubines for failing to follow military orders, Sun’s stern generalship was regrettably recognized by the king. Together, Wu ZiXu and Sun Zi commanded a victorious army and propelled the Wu kingdom into dominance. The Wu kingdom was located on the lower right corner of the following map of China, next to the lake and by the sea. 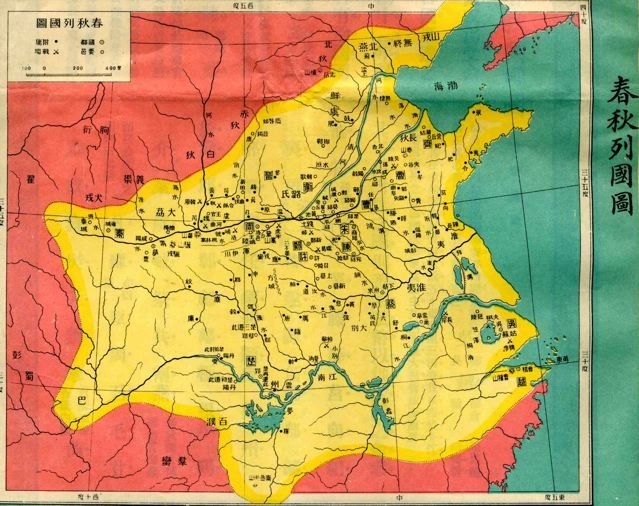 A neighboring state, Yue kingdom 越國, lay to its south and vied for power with the Wu kingdom 吳國. Both the kingdoms of Wu and Yue were peopled by the Bai Yue tribes 百越族 who populated lands from today’s Shanghai to Vietnam, and were ethnically different from the Han 漢族 people of China proper in the north. After a series of battles, the Yue king surrendered and was made a slave in the Wu court. The Yue prime minister schemed and presented a beautiful woman Xi Si 西施, one of four greatest beauties in Chinese history, to the Wu king. 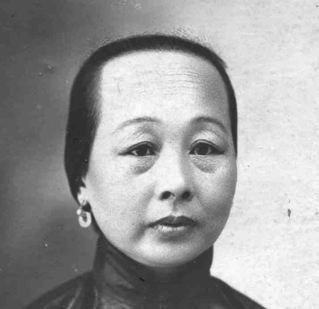 The Wu king fell in love with this beauty and neglected state affairs. Seeing how obedient the Yue king was and being influenced by his beloved Xi Si, the Wu king decided to release the Yue king after three years of servitude. Wu ZiXu objected to this release vigorously and was sentenced to death by the angered Wu king. 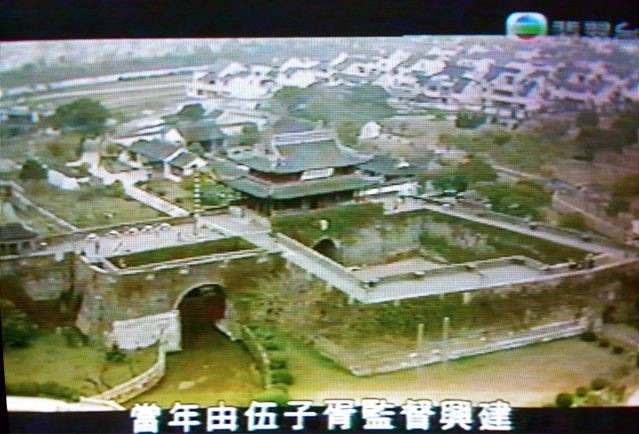 But before he was executed, Wu ZiXu asked that his eyes be taken out and placed on the SuZhou 蘇州 city gate so they could see the Yue army march into the Wu kingdom later. After his release, the Yue king strived to revive his Yue kingdom. To remind himself of his humiliation and purpose, he slept on a bed of firewood and tasted bitter bile everyday (臥薪嚐膽). After 20 years of building his state and training his people, the Yue king attacked the Wu kingdom. 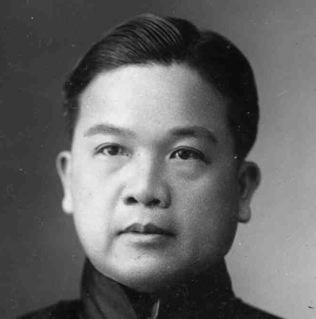 To shock and demoralize the Wu army, he ordered death row inmates to commit suicide en mass in front of the Wu army. Following successful battles, he defeated the Wu king and forced him to commit suicide. Wu ZiXu designed the capital of the Wu kingdom and that design survived to this day as the beautiful city of SuZhou 蘇州. SuZhou city is known for its beautiful classic gardens, recognized by UNESCO as a World Heritage Site, built almost 2,000 years after Wu ZiXu’s death. 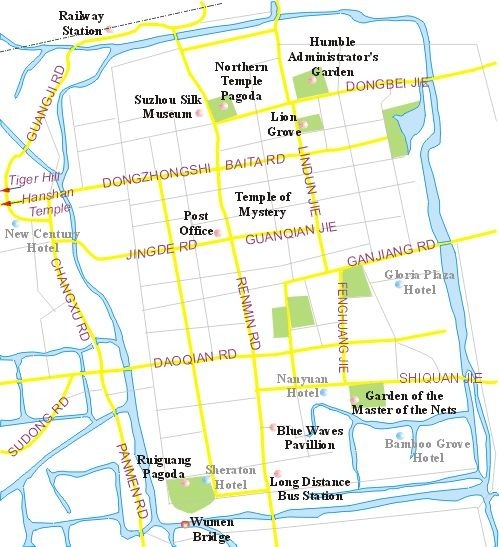 Although SuZhou underwent numerous rebuilding in the last 2,500 years, its basic design of streets, city walls (mostly demolished now), gates, canals, and moat remain unchanged, testifying to the genius of Wu ZiXu. In SuZhou city today, we can see a city gate named Xu Gate 胥門 in honor of Wu ZiXu. 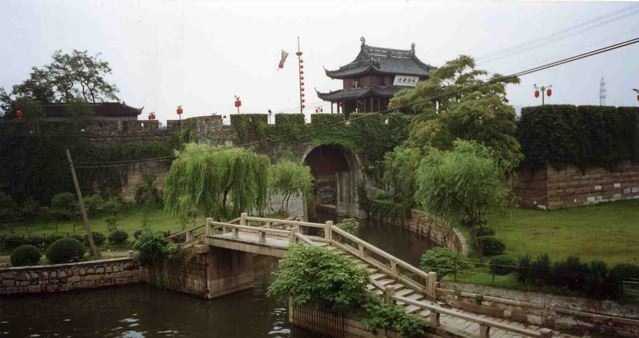 Wu ZiXu designed the Pan Men Gate 盤門 on the southwestern corner of the SuZhou city wall. 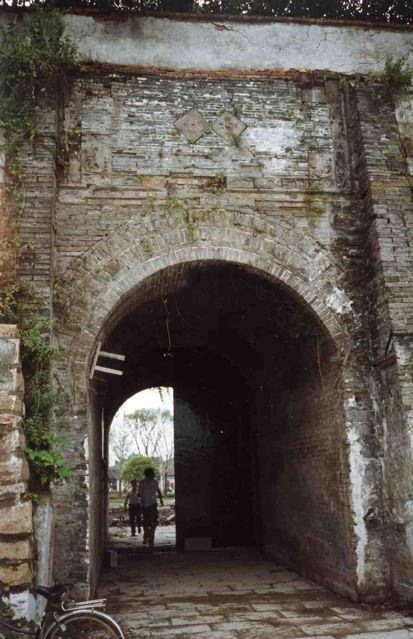 It is a combination water/road gate and is the only one extant in China today. The water gate has a double gate system to allow only one ship to enter city canals at a time, and the road gate has a gate house compound to trap and kill invaders. This is the water gate relic. With a footbridge blocking the canal leading to the gate, this water gate is not functional anymore. It testifies to the importance of water traffic to this southern city’s economy and everyday life. There is a temple dedicated to Wu ZiXu near the Pen Men Gate. 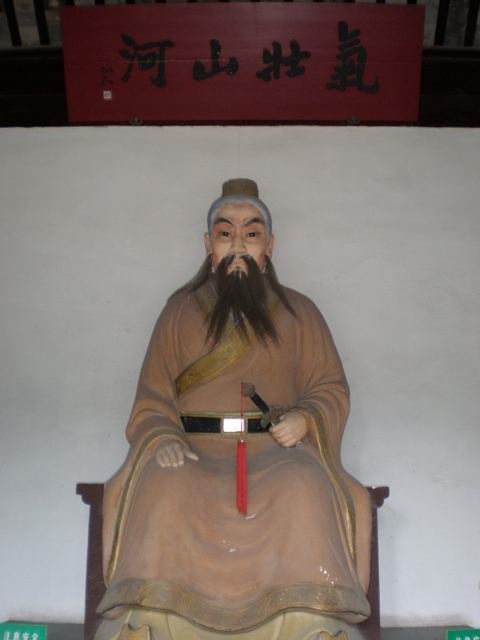 The statue of Wu ZiXu in his temple. True to history, notice his hair is white. The statue holds a sword, but the design of the sword is at least 1,500 years later than Wu ZiXu’s time, belying the statue designer’s carelessness or ignorance. As a 75th generation Wu, I bowed to my third generation ancestor when I visited the temple. My Wu 伍 clan has been living in the county of TaiShan 台山 in GuangDong 廣東 province for many generations. 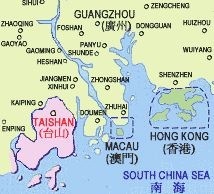 TaiShan is west of Hong Kong and Macao, its proximity facilitated the emigration to overseas work opportunities. In the late 1800s, famines and warfare drove thousands of TaiShan men to look for work first in America, then in Australia. 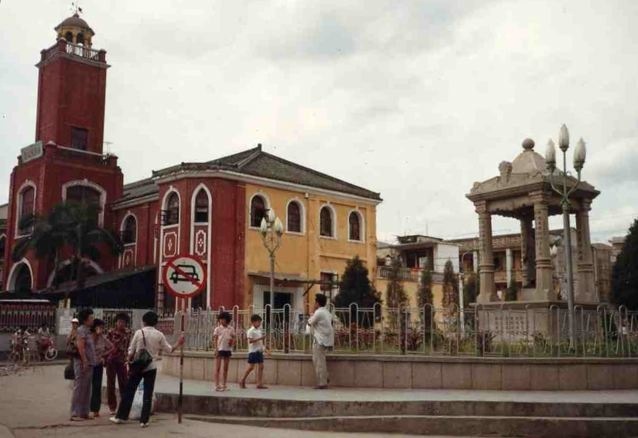 While there are 1 million people living in TaiShan today, there are 1.3 million descendants of its emigrated sons and daughters living overseas. TaiShan county was developed ahead of the rest of China a hundred years ago due to its emigrants’ exposure to the outside world. Returning Chinese Americans built a private railroad in 1910 that helped propel the county seat into a thriving town. The old train station is still the center of the town although the tracks were torn down during WWII and shipped to Japan to make weapons. The statue of the Chinese American who initiated and built the railroad still stands in the pavilion. 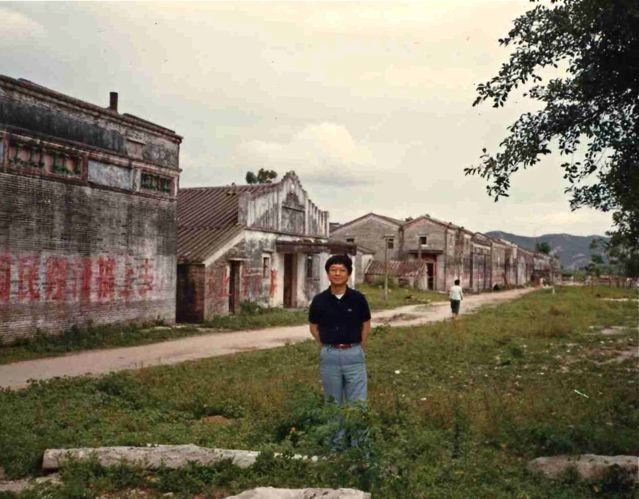 When I went to TaiShan 25 years ago, it was recovering from the ravages of the Cultural Revolution. 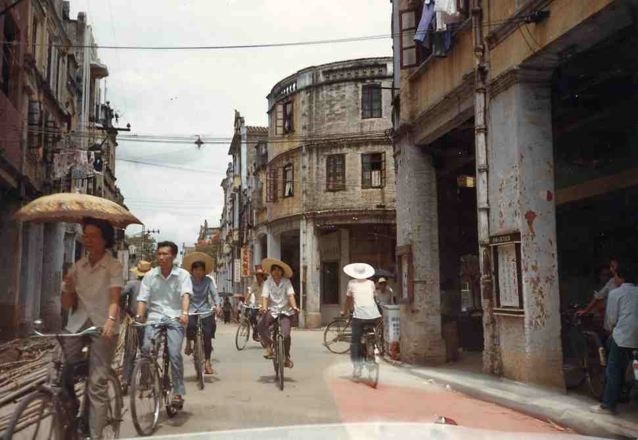 Its streets were narrow, the people were dressed in uniform white shirts, and bicycles were the primary means of transportation. The people’s faces look just like those I see in New York Chinatown, and they talked just like shop keepers in Chinatown. They looked ready to emigrate to the US and join their relatives there. I felt very much at home. Today, these streets are filled with private cars and the people are up to date in every respect. I visited the girls’ teacher middle school where my mother and Sally’s mother studied at different times, and where my father taught in the early 1930s. It was one of the first schools for girls in China, making TaiShan an enlightened place in an otherwise conservative China . Sixty years later, I stood in the corridor of a worn school house. My athletic mother was a star in the school baseball team. 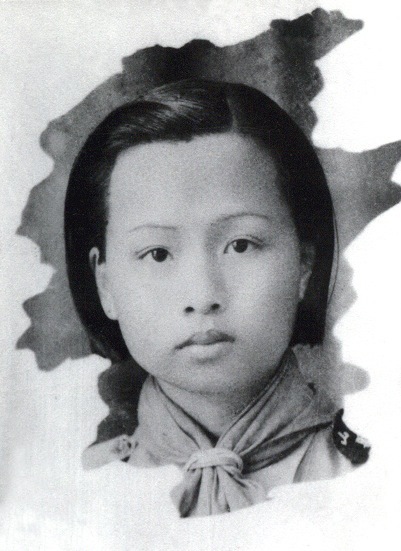 Sally’s mother, Chiu Sui Ung 趙瑞鶯, joined the Girl Scouts while in middle school. My paternal grandfather Ng Siu Chueng 伍少泉 grew up in TaiShan but spent the biggest part of his life in Hong Kong. He was a handsome man in 1920. 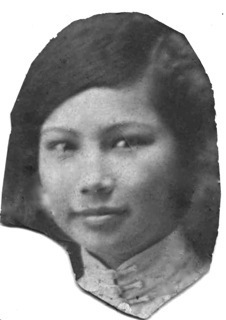 My paternal grandmother was a beautiful woman in 1920. She had bound feet and could walk only with difficulties. Too bad I did not inherit their good looks. My father Robert T.C. 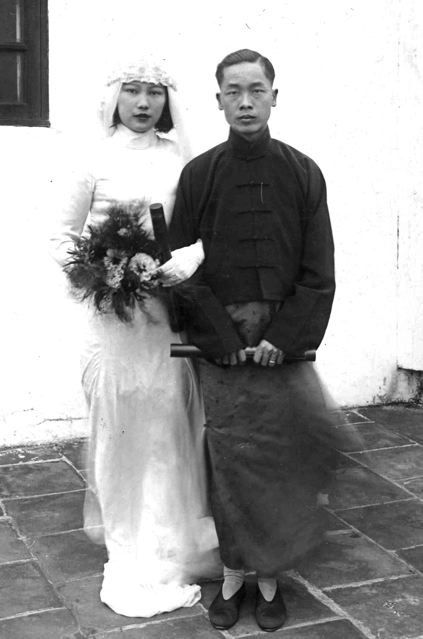 Wu 伍子俊 married my mother Frances Lew 劉翠珊 in TaiShan in mid 1930s. My father adopted the Mandarin pronunciation of his surname Wu 伍 from the Cantonese Ng 伍 when he attended YanJing University 燕京大學, the predecessor of today’s Beijing University 北京大學. 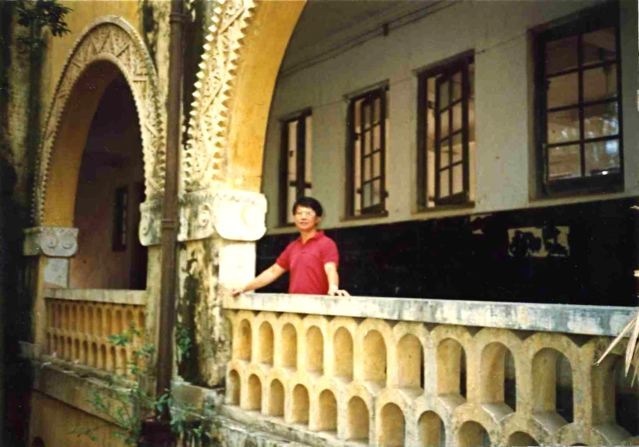 I visited the XinHuaLi village 新華里 in the GuanDou district 官竇 of our clan in the 1980s. The name of the district means “the nest of officials”. The walls of the houses still bore slogans of the Cultural Revolution. While it looked plain, the grey brick houses were well-built and cost a good penny. Maybe some of the district’s sons nurtured in this nest did become officials and came home to build these sturdy houses. Posted by Robert Wu on Thursday, December 10, 2009, at 10:39 pm. Filed under Uncategorized. Follow any responses to this post with its comments RSS feed. You can post a comment or trackback from your blog.